It makes sense that she relates the experience to a TV show, since her artwork takes characters from 1980s and early-’90s television and movies as its subject matter. The 30-year-old Wallsburg, Utah, native studied art at the University of Utah with professor Sam Wilson, and earned her bachelor’s in 2003. Growing up in Heber, her childhood was full of the television shows of the period. At first, her paintings were larger, more design-influenced, with abstract patterns and shapes, but then she narrowed her focus down to smaller pieces depicting TV and movie celebs. Blackburn opened Frosty Darling five years ago, when Kenny Riches relocated Kayo from its original location, now the home of Nobrow Coffee. She thought it would be a place for her to work on her art, but the commerce side of it soon became all-consuming. The “toy store for grownups,” full of little knick-knacks, had a whimsical feeling, with a pony in the front display window. Although it was a popular spot, consigning the work of over thirty local artists and craftspeople, the financial strain eventually forced her to close. Blackburn’s return to the space is a happy day for local art lovers who have come to recognize her work and the way it instantly brings a smile to their faces. These paintings are all recent work from the past four months. She says “Pure Magic,” depicting Magic Johnson, is “the most bizarre painting I’ve ever done.” With the subject smiling and holding a ball aloft as children jump to try to get it, the painting is friendly, yet a bit prankster-ish. The original image, from a TV special about HIV, contains several layers of meaning, a complexity masked by the painting’s surface. These images are always familiar yet slightly obscure, not obvious campy ’80s references; they evoke mostly a reaction of, “Oh, yeah, now I remember that,” rather than a groaning, “I’ve seen this so many times.” “Duck Face”—Stephanie Tanner’s friend from the show Full House—is obscure to the point of being nearly forgotten. The two “Lady Cops” from Cagney & Lacey are formally posed, the frame resembling a cameo locket, as opposed to their casual demeanor on the show. The painting depicts a no-nonsense attitude but also a grace and femininity that the female “buddy show” glossed over. 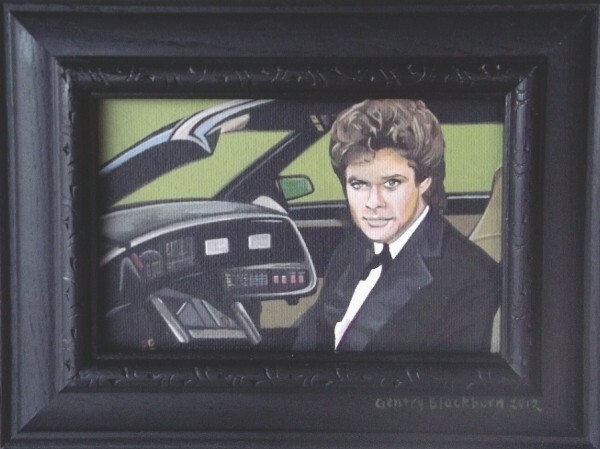 “Knight on the Town” shows Michael Knight from the series Knight Rider in a tuxedo with talking car KITT, as though he might be taking the vehicle out for an evening. “Bronson on the Line” gives us the iconic actor, shirtless, in a phone conversation that might be threatening a thug or romancing a paramour. Andy Warhol was a huge influence on Blackburn’s work. She named her store after Warhol’s actress friend Candy Darling; it’s also her nom-de-needle in crafting. But Blackburn’s images don’t have the hipster irony of Warhol’s work. Instead, her work is an affectionate celebration of faces with the kind of recognition you have for friends from down the street. There is a kind of comfort and warmth in these retro icons, as opposed to the impersonality of current celebrities. The 1980s prefigured the present cultural landscape in many ways, and these works represent nostalgia for a time before seemingly everyone was an aspiring celebrity. Blackburn has sold many of the small works, and has also been commissioned for some specific characters. A collector in Texas has commissioned her for 10 portraits, including Flo from Alice, Doc Brown from the movie Back to the Future, and Chris Farley’s “Fat Guy in a Little Coat” character from the movie Tommy Boy. "Since closing the shop, I’ve been catching my breath,” Blackburn says, who has returned to her pre-Frosty Darling work as a librarian. She has been working on stuffed animals, aprons and pillows for Craft Lake City and other events, and she hopes to return to larger canvases, although she still accepts commissions for smaller works.